please call us on 01780 720 217. 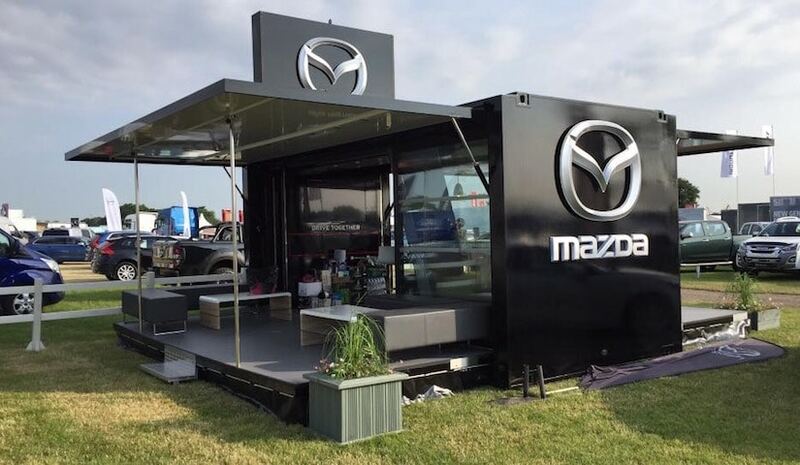 Mazda UK made the decision to invest in a premium outdoor events unit and approached Versatile for our support. The brief included the need for a spacious, flexible solution including the option to display cars either on or off the unit with access to digital displays to be used to show Mazda specific content. The finished unit is a real head turner and often gets commented about out in the field. Not only does it look good but it is also a functional hospitality space with coffee facilities, TV screens, and hospitality areas with top spec furniture as well as a weather proofing option to enable use whatever the weather. We continue to manage the logistic operations for Mazda by facilitating storage, arranging install and derig & always having an Event operator on site throughout the duration of the event. Why pay for experiential marketing?